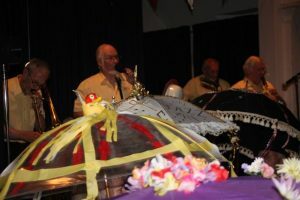 CELEBRATED bandleader and trumpeter Dave Stradwick will be bringing his friends in the Sussex Jazz Kings to kick off Chobham Festival on Saturday 24 September with a stomping evening of dancing and dining at Chobham Village Hall. Dave and the band are renowned for their humour and their hot trad style of jazz. Tickets are £20, including supper. For a change of mood, English Music by Candlelight at St Lawrence Church on September 27 features works by two of our most renowned native composers Edward Elgar and Ralph Vaughan Williams (hailing from Dorking). Included on the programme is The Lark Ascending, arguably Vaughan Williams’ best loved piece – it has now topped the Classic FM Hall of Fame for the third year running. Perhaps not so well known is Gerald Finzi, a Londoner of Italian-German-Jewish descent. The concert in Chobham falls exactly on the 60th anniversary of his death in 1956 and, to mark the occasion, the Le Page Ensemble, with soloists David Le Page and Marie Lloyd, will be performing Finzi’s delightful Five Bagatelles for clarinet and strings. Our Top Brass concert features the big sound of the Guildford Friary Band. Now based in Chobham, it is led by former Grenadier Guards bandmaster Chris King and is officially the top band in London and the Southern Counties after being crowned regional champions for two years in succession. They are playing for at Chobham Club on Wednesday on 28 September. Tickets are £10. The festival’s musical centrepiece is an evening of ‘Handel in the Wind’ on Saturday 1 October, again at St Lawrence Church, with the dynamic and highly entertaining baroque instrumental group, Red Priest. This is Handel as you have never experienced him before. Tickets £15/£20. Friday, Saturday and Sunday September 30 – October 2 is the Flower Festival at St Lawrence, Church, bringing flower artistry from clubs, societies and schools into the church and church hall for three days. Entry is £2 and will go to the fund to repair the tower at St Lawrence Church. The festival café in the Church Hall will be open throughout the flower festival and will feature live music from Teddington Ukulele Players at various times on Saturday. The renowned Chobham Morris will also be visiting. The festival concludes with a village Songs of Praise on Sunday October Information at Chobham.Festival.Org or call 01276 857222.